Magic happens when you put a few ingredients into a thin metal vessel over a flame. The heat triggers a chemical reaction in the amino acids and sugars, releasing what the Chinese call wok hei, the distinctive, often elusive, wok fragrance. It can be hard to replicate wok hei on domestic stoves because the heat is less intense than the fierce gas burners used in Chinese restaurants. To overcome this, you'll need to crank up the heat and preheat the wok for a few minutes before you start, making sure the oil is shimmering or just starting to smoke before you add the ingredients. 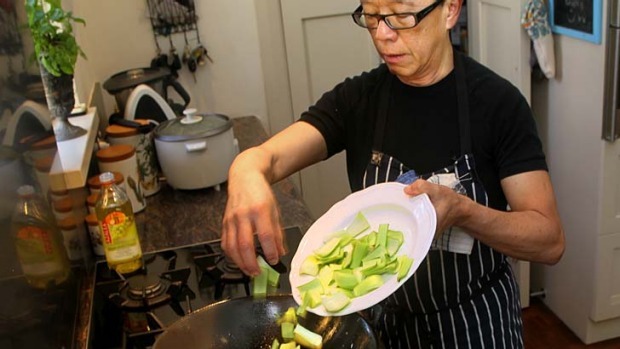 Grapeseed oil is Tony Tan's oil of choice because of its neutral flavour and high smoke point, the temperature at which the oil starts to smoke. Tan says he would never dream of using a non-stick wok, preferring a round-based cast iron or carbon steel wok, which he seasons before use. Most woks have a ring on either side, which gets hot along with the wok. Protect your hand with a clean, folded tea towel or oven mitt when you're tossing the ingredients in the wok. Many woks also come with a lid, handy for slow braising as it prevents the liquid from evaporating. But for a stir-fry, you want to cook the dish quickly in a small amount of oil with the lid off so the steam escapes. After use, Tan washes his wok under hot water and cleans it with a cloth wipe or sponge. Scouring a wok with a metal scrubber and liquid detergent strips off the coating, so best to avoid this. He then dries the wok over a flame, removing it from the heat and rubbing on a scant teaspoon of grapeseed oil with paper towel to prevent rust. As with pizza toppings, less is more when it comes to successful stir-fries. Adding the entire contents of the vegie crisper will give your dish in an indistinct, muddy flavour. "There's no hard-and-fast rule but you don't want to turn it into chop suey," Tan says. He suggests choosing up to five main ingredients, plus some seasoning ingredients. That might mean lean meat, shellfish or tofu, some onion or spring onion, and several vegetables, along with seasonings such as ginger, garlic, hoisin sauce, fermented black beans or shaoxing rice wine. Seasonal vegetables: asparagus, bean shoots; beans; bok choy, broccoli, broccolini, cabbage, capsicum, carrot (cut into batons or thin discs), celery, choy sum, cos lettuce, mushrooms, snow peas. Prepare all the ingredients before you turn on the stove. A stir-fry cooks so quickly that you need everything ready and at hand. Have the rice cooked and ready to serve when the stir-fry is done. A rice cooker is a handy tool – you can leave the rice to cook by itself, and it's one less pot on the stovetop. Cut all your ingredients more or less the same size so they take the same time to cook. Bite-sized is best. Dry the vegetables with paper towels so they cook quickly rather than steam. 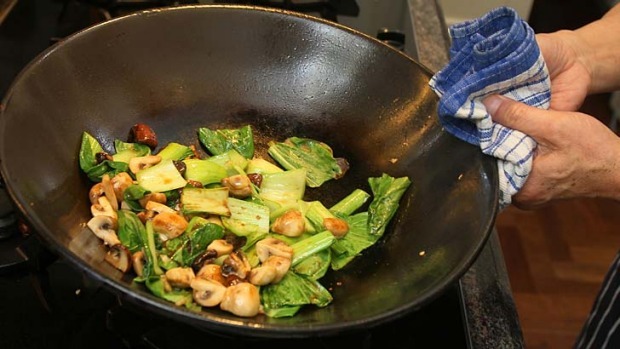 Add thicker and firmer vegetables to the wok first – they take longer. Measure out the liquids and have them within reach of the stove. If your stir-fry contains meat, marinating it even briefly adds more flavour. Partially cook the meat first, then set it aside on a clean plate until the vegetables are tender-crisp. At the last minute, return the meat to the wok to reheat. Add firm (pressed) tofu towards the end of cooking, ensuring it heats through. Avoid stirring it around the wok too much or it will crumble. Don't over-crowd the wok. If you're cooking more than 500g of ingredients (enough for two people, or four with other dishes), cook in batches so the vegetables retain some crunch and the meat doesn't stew. Use a wooden spoon or shovel-shaped wok chan to keep the ingredients moving. Although celery is used for this recipe, you can substitute any vegetable with some crunch, such as baby bok choy, broccoli or capsicum. Pork, lamb, beef and seafood are also great cooked this way. Mix together 1 tablespoon shaoxing rice wine, 1/2 tbsp light soy sauce and cornflour in a medium-size bowl and marinate the chicken pieces for 10-15 minutes while you chop the vegetables. Mix remaining soy sauce, sugar, chicken stock, vinegar, oyster sauce and sesame oil together in a small bowl and set aside. Preheat the wok on the highest possible flame. Add the oil and when it starts to shimmer or just smoke, add the ginger and stir-fry 20-30 seconds. Quickly add the garlic and drained chicken and stir-fry for a minute or until the chicken is just beginning to turn white. Remove and transfer to a clean plate. Wipe out the wok with paper towel. Reheat the wok and add a little more oil if necessary. Add the celery and half the spring onions and stir-fry for 1 minute, keeping the vegetables moving around the wok and tossing them in the pan (protect your hand with a clean, folded tea towel or oven mitt). Pour in the remaining rice wine and stand back in case it flashes. The rice wine adds a delicious smoky flavour to the dish. Add chicken stock mixture, reduce the heat to medium-high, and cook for 2-3 minutes until the pan juices reduce slightly. Return the chicken to the wok and add chilli (if using) and remaining spring onion and season to taste with salt and pepper. Serve hot with steamed rice. Many stir-fry recipes start with frying ginger and garlic. I tend to add chopped garlic once I've added the bulk item to prevent it from burning. If you're serving this with rice, prepare it ahead. Dinner will be ready in a few minutes. Cut the bok choy stems from the leaves and cut the stems into 3cm lengths. For larger bok choy, cut the stems into bite-size pieces and cut leaves in half crosswise. Keep stems and leaves separate. Prepare all the other vegetables and set aside. Mix together the oyster sauce, water and soy sauce in a small bowl and set aside. Heat the oil in a wok set over high heat. As soon as the oil shimmers or just begins to smoke, add the ginger and quickly stir-fry for 5 seconds. Add mushrooms and continue to stir-fry until they soften and wilt, 2-3 minutes. Add the garlic and give it a toss for a couple of seconds. Don't let the garlic brown or it becomes bitter. Add bok choy stems and toss for 1 minute before adding the leaves. Continue to stir-fry rapidly and as soon as leaves begin to soften, add the oyster sauce mixture. As soon as the sauce begins to boil, toss in the chilli and coriander. Serve immediately with steamed rice. Chef Tony Tan will lead a food tour of Vietnam, taking in cooking classes, markets and historic sites, from August 30 to September 9, 2013. Details: tonytan.com.au.